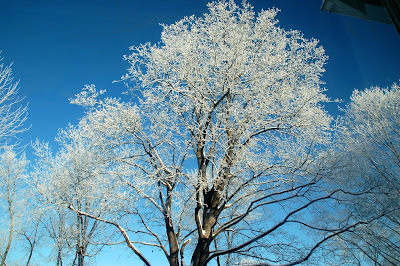 Hoar frost in St. Paul on Monday morning. Update as of 6 p.m. on Tuesday night: Rest assured that your local weather forecasters are hard at work analyzing the possibilities as the week-end, year-end storm approaches. Most look for rain on Thursday, which may begin as freezing rain, and rain turning to snow on Friday with a small accumulation. The Star Tribune/Paul Douglas seems the most certain of snow, declaring without condition that "rain ends as accumulating snow New Years Eve," with 2-3 inches of snow forecast. MPR leaves the door open to heavy snow possibilities, though no specific accumulations are mentioned. Follow us on Twitter for additional updates. "The heaviest snow will be in Central and Western Minnesota with blizzard like conditions for Western Minnesota. Far less snow expected in the metro with a couple of inches." Thursday morning commute could be interesting. Snow expected on Friday, "some heavy." No advisories or warnings for the Twin Cities now, but I’m sure that will change. 70 percent chance of rain and snow Friday. 50 percent chance of snow on Friday night. No mention of accumulations. The second low tracking towards Kansas City on Thursday could turn north and produce a band of heavy snow close to the Twin Cities to Duluth on Friday into New Year's Eve. No accumulation specifics offered. Thanks for the update. I am a weather enthusiast myself and very much enjoy this blog. Big margin of error on this storm. 75 miles west and its all rain. 75 miles east and it could be a big snow event.